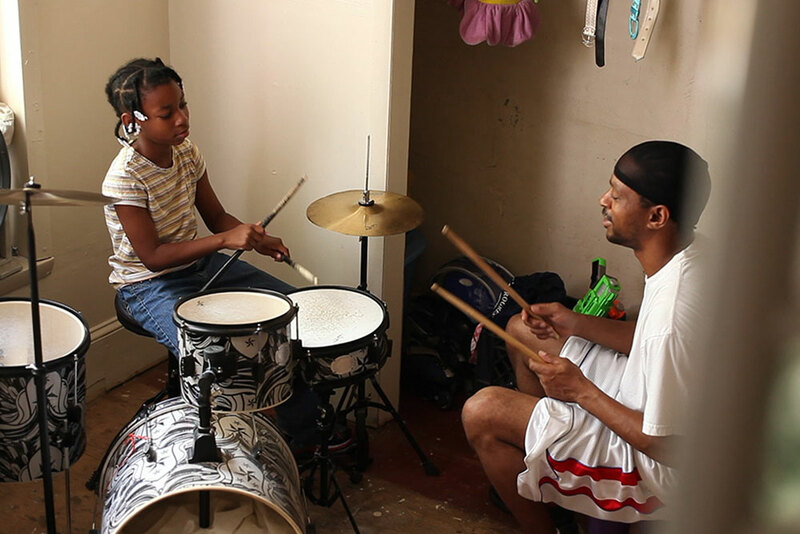 A deeply compassionate film set in the neighborhood, home, and work spaces of one North Philadelphia family, Quest is that rare documentary which combines a grounded, unfussy technique behind the camera with an unadorned, lived-in story of real people in front of it. This reminds us that the very best American documentaries have the texture of novels, or memoirs, or observant non-fiction reporting. Filmed over nearly 10 years by one-man band director, cinematographer, and sound recordist Jonathan Olshefski, Quest is named for the lead character, Christopher “Quest” Rainey, the steady, likeable father of his teenage daughter Patricia, and husband to his equally engaging wife, Christina’a, also known as Ma Rainey. Quest runs a scruffy basement recording studio for local rappers, delivers papers on foggy mornings, and seems to also do some construction when he can. Ma works at a halfway house. Nearly everyone in this film is black, yet the film never rests on the specificity of race as the defining aspect of the Rainey’s story, even when street violence directly (and drugs indirectly) take their toll on some of the characters. The film is specific however in how the family is held together by love, mutual respect, an abiding intelligence, and a refusal to cop-out or give up. The Raineys may be the most inspiring family you’ll see in a film, fictional or otherwise, all year. They are a microcosm of life in the United States, a life made up of random joys, bruising tragedies, and a constant struggle for money. Like too many Americans in the middle and lower class, their hopes and dreams are one step ahead of sorrow, and their response to potentially devastating setbacks is to take what comes next one day at a time. You can see that daily life clearly weighs on Quest. His daughter is disfigured in a random shooting. His stepson (a new father) undergoes treatment for brain cancer. A rising star rapper and family friend is beset with drinking and drug addiction. Plus, there is the petty annoyance of a leaky ceiling, and the not-so petty specter of Donald Trump’s presidential campaign looming from the TV, captured in a clip of his insulting olive branch to urban blacks to vote for him because, “What have you got to lose?” The contrast between the Rainey’s warmth and humanity and Trump’s racist moral void is staggering. What we see is a community alert and engaged in making their streets safer, where even the white cops are an acceptable part of the fabric rather than an adversary. Olshefski’s subtle camerawork is made up of in-the-room medium shots and pointed close-ups, natural light and handheld tracking shots. It’s refreshingly low-fi; free of drones, sliders, talking heads, and overlit interiors. The soothing intimacy is inviting and freeform. But when the random shooting takes place (off camera) about halfway through, much of the rest of the film concerns itself with Patricia’s comeback and her changing sense of how she sees herself. Although this extended segment is handled with sensitivity, it restricts the film’s scope, exchanging its immersive textures for a more conventionally driven narrative. The timeline becomes muddled, important milestones are ignored (what happened to the stepson’s wife? ), characters fall away and other issues–community activism, political indifference, that damned leaky ceiling–are never followed up on. The logos of several documentary industry organizations–the IFP, ITVS, POV, the MacArthur Foundation, Kartemquin Films (see my review of Minding the Gap)–are plastered on the end credits, and any one of these entities could be responsible for urging Olshefski to conform his footage into a more manageable trajectory. Personally, I preferred the spontaneity of the expansive portrait the film began with; a much longer film, although commercially risky, should have been encouraged. Instead, at 105 minutes, this tidier Quest feels about 20 minutes too long.